Notes: Edward and Catherine are also listed by Weir, but as doubtful offspring. The Complete Peerage vol.XIIpI,p.65-66. English lord whose secret marriage to an heir to the throne angered Elizabeth I and probably influenced her choice of James VI of Scotland as her successor. 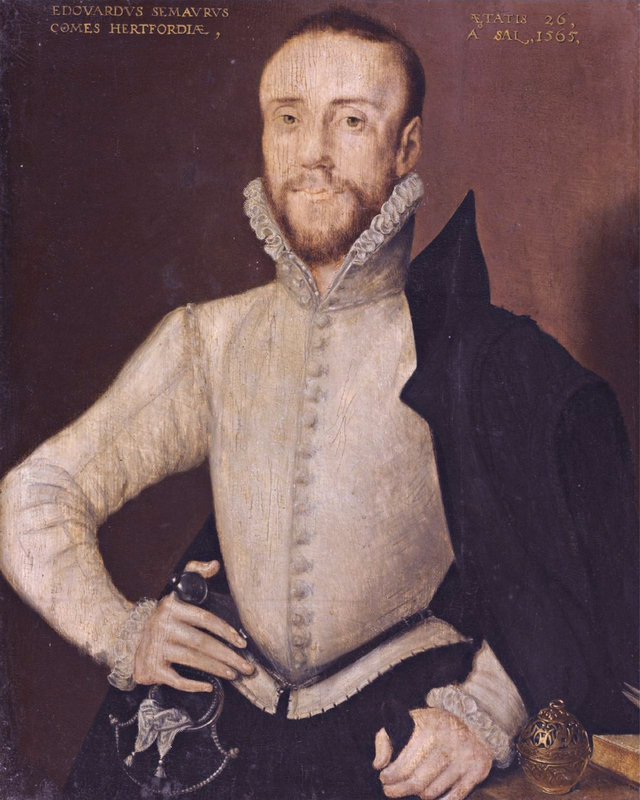 Sir Edward Seymour, 3rd son of Edward, Duke of Somerset and Earl of Hertford, being 1st son by his 2nd wife, Anne, daughter of Sir Edward Stanhope, was born (the same day as King Edward VI) 12 Oct 1537, and, being (under the spec. rem. in the creation of those dignities) heir apparent to his father's Dukedom and Earldom, was styled Earl of Hertford 1547-52 (when those honours were forfeited), and being so styled was one of the 40 knights (made as K.B. 's), 20 Feb 1546/7, at the Coronation of Edward VI. He was a hostage to France 7 Apr 1550; was corrupted in blood by his father's attainder in 1552. The attainder passed on his father was relieved by Act of Parliament in the reign of Mary I (1551); and, two months after the accession of Elizabeth I, Seymour was created Baron Beauchamp and Earl of Hertford (Jan 1559). After a brief courted of Lady Frances Meautays, in 1560 he secretly married Lady Catherine Grey, second daughter of Henry Grey, Duke of Suffolk, and sister of Lady Jane Grey. On her sister's death (1554), Catherine had come to stand next in succession to the throne after Queen Elizabeth according to the will of Henry VIII. On this account both parties to the marriage incurred the great displeasure of Queen Elizabeth (who jealously desired "to keep the sisters Grey spinsters") when the secret was exposed; they were imprisoned in the Tower of London in 1561 and were not released until 1563, after Hertford paid a heavy fine; even thereafter they remained in private custody. In the High Commission Court appointed to "judge" of the "infamous" proceeding and the "pretended marriage" the Archbishop of Canterbury pronounced, 12 May 1561, that there had been no marriage, and the Earl was fined 15,000 pounds by the Star Chamber "for seducing a virgin of the blood royal" and for breaking prison, i.e. visiting his wife, who was also in the Tower, and begetting his two sons, both of whom were born there. In 1563 there was an outbreak of plague in London and an exodus of everyone who could afford to leave. The Seymour family was moved, Edward and little Edward sent under house arrest to Hanworth, where his mother Anne still lived; Catherine and baby Thomas went to her uncle John Grey's home in Essex. In 1564 Catherine was transferred to Ingatestone under the custody of Sir William Petre. That same year, Hertford was removed from Hanworth and placed with Sir John Mason. When Mason died in Apr 1566, Hertford remained with his widow in London for a time, then was transferred to the keeping of Sir Richard Spencer. Catherine died 27 Jan 1568 at Cockfield Hall, in Yoxford, Suffolk (the house of her gaoler, Sir Owen Hopton), and was buried 21 Feb 1567/8, at Hoxford. She had spent nearly seven years in various prisons and was twenty-seven when she died. Edward, upon hearing the news, was heartbroken. But he also hoped for release. Perhaps Catherine's death would end the Queen's anger. Two years later, he was rewarded; he was released and pardoned. Admitted (specially) to Gray's Inn 2 Feb 1570/1; created M.A. Cambridge 30 Aug 1571. In 1586, he married again to one Frances Howard, daughter of William, lord Howard of Effingham, and sister of Charles, 1st Earl of Nottingham, by his 2nd wife, Margaret, daughter of Sir Thomas Gamage. They had no children and Edward never stopped petitioning the courts to legitimize his sons with Catherine. In Sep 1591 entertained the Queen at his seat at Elvetham, in Hampshire; Elizabeth again lodged him in the Tower in 1596 on account of his attempt to get the legitimacy of his son and heir apparent, Edward, established before the Court of Arches. (In 1606, three years after Elizabeth's death, the clergyman was found - fifty years after the fact! - and a common law court legitimized the marriage and their sons. Frances Howard died s.p. 14 May 1598, in London, aged 44, and was buried in Westminster Abbey, and Edward married thirdly (lic. Dean and Chapt. of Westm., 27 May 1601, to marry at his house in Canon Row), other Frances Howard, her cousin, widow of Henry Pranell, a wealthy wine merchant, of London (who died 20 Dec. 1599), and daughter of Thomas Howard, 1st Viscount Howard of Bindon, by his 3rd wife, Mabel, daughter of Nicholas Burton. Lord Lieutenant of Somerset and Wilts 27 Apr 1602, and again 1608; sent on an Embassy to the Archduke, at Brussels, to receive his oath of peace, Apr to May 1605. Elizabeth I denied the fact of their marriage, together with the legitimacy of their two sons. The elder son, Edward Seymour, styled Lord Beauchamp notwithstanding the question of his legitimacy, was ignored as an heir when Elizabeth was on her deathbed; she chose the King of Scotland, who became James I of Great Britain. Edward died 6 Apr 1621, at Netley, aged 83, and was buried at Salisbury Cathedral. M.I. Admon. as "of Letley [now Netley], co. Southon," 5 May 1621. Inq. p.m., 4 Apr 1626, at Marlborough. His widow married (as his 3rd wife) Ludovic Stuart, 1st Duke of Richmond, who died s.p. legit, 16 Feb 1623/4, aged 49. She died s.p., at Exeter House, Strand, 8, and was buried 12 Oct 1639 (with her 3rd husband), in Westminster Abbey, aged 63. Fun. certif. in Coll. of Arms. Will dated 28 Jul, pr. 31 Oct 1639. Both of Edward sons already dead, but his grandson, William Seymour, had already re-enacted Edward and Catherine's tragic love story by making a secret marriage of his own - to Lady Arabella Stuart, a member of the royal family. Also, Edward apparently didn't gain sympathy for young lovers through his own experience - his and Catherine's eldest son, Edward, married Honora Rogers, a girl far below his station; Edward did everything he could to end the marriage and his son threatened to commit suicide rather than return to Edward's home.